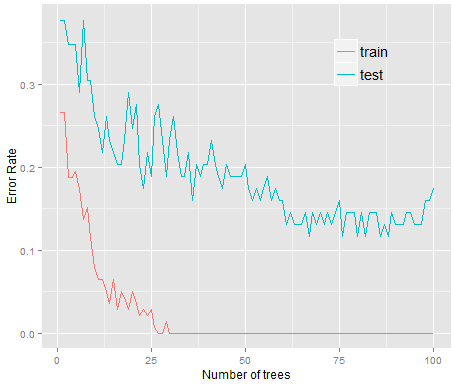 AdaBoost: Why does test error decrease even after training error hits zero? After applying AdaBoost to the Sonar data, I obtain something like this. I dont understand that phenomenon, can anyone enlighten me? The takeaway from all their math is, that even when the training error is zero, the margin (= sample distance to decision boundary) is still improved by further boosting iterations. Also, among other things they show that there are lower upper bounds on the generalization error for a classifier with larger margin, which at least supports what you are seeing. Not the answer you're looking for? Browse other questions tagged error adaboost or ask your own question. Can AdaBoost be used with multiple measurements? How to apply weights in building decision tree? What is the learning rate in AdaBoost?